The blood of the horseshoe crab is worth more per weight than gold. The Freaky meets the people who bleed crabs for a living. Fisherman Jerry Galt is a man on a time-critical mission. He has just 2 hours to find something that’s been lurking beneath these waters for hundreds of millions of years. “We come on the full moons when the tides are tall and they’re coming up to spawn to lay their eggs,” says Jerry. If Jerry can find it, he will be a lot richer, and he’ll also be playing a crucial part in saving the lives of millions of people. 10 minutes later he has struck gold. “How about this historic creature, they make horror movies out of things like this !” he says excited. The strange creature he has caught in his net is a horseshoe crab – a living fossil that dates back 450 million years – that’s way before dinosaurs made their first appearance. Like Spring Break teenagers on heat, thousands of these crabs gather on this beach every year to cop off. The crabs come up on these high tides during the full moon tides and lay their eggs (and spawn) In between the moons, the eggs incubate and hatch. And they don’t have trouble finding a partner in the dark because they have 10 eyes. Tonight Jerry manages to gather up approximately 600 horseshoe crabs. “They’re only up on the beach for a couple of hours before and after the tide so we have to hustle to catch them,” he says. These crabs are normally caught and used for bait to catch eels but not tonight. These crabs have a weirder purpose. “When I arrived here to deliver the crabs, it was like, what is this place?” says Jerry. Jerry is talking about the cutting edge medical facility that he delivers his crabs to. Thanks to a magic ingredient that’s ensured their survival all these millions of years, they’ve become a highly valuable scientific asset. What the scientist’s want is the horseshoe crab’s blood. – which is freakily coloured blue. Our blood is red because it is iron rich, the crab’s blood is blue because its rich in copper. But its not the colour that interests the scientists it a special enzyme within the blood. An enzyme that saves millions of lives every year. The enzyme is an incredible detector of bacteria. 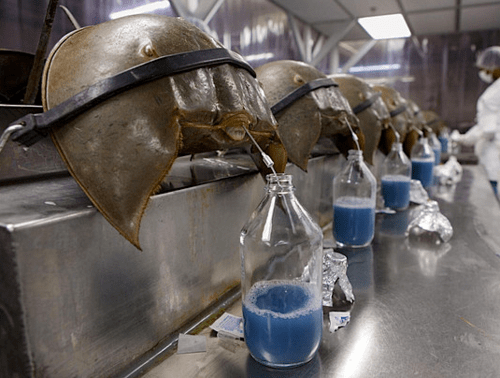 “There is an immune system in the crab’s blood that is very primitive yet very effective.” Says Dr Norman Wainwright, head scientist at the crab lab. He shows me a vial. He takes a syringe and drops in a tiny drop. Incredibly the vial solidifies. “The blood cells, when they come into contact with bacteria, release high concentrations of enzymes and these enzymes cause a blood clot,” explains Dr Wainwright. What’s amazing is the enzyme can detect bacteria at less than one part per trillion.That’s like a pinch of salt in over 2 million gallons of crab chowder. “This extremely sensitive enzyme reaction in the blood is a fantastic tool for us to determine the level of cleanliness of drugs and medical devices,” says Dr Wainwright. This test is used by pharmaceutical manufacturers to ensure their drugs and equipment are free from bacteria.No other test is as cheap or reliable. And that’s why the crab’s bllod is so precious and why one quart of the crab’s blood is worth over $15000 dollars. The blood is extracted from a chink in the crab’s armour – the fleshy hinge at the root of its tail and near its heart. “I assure you they come to no harm, not hurt in any way” says Dr Wainwright. Each crab donates around 100 ml, which is a third of its blood. The blood is then purified and from it the enzyme extracted. Finally, the enzymes are freeze dried into vials which are sold to doctors and hospitals the world over. It’s a highly involved process that Dr Wainwright and his crab bleeding team carry out on thousands of crabs every week. 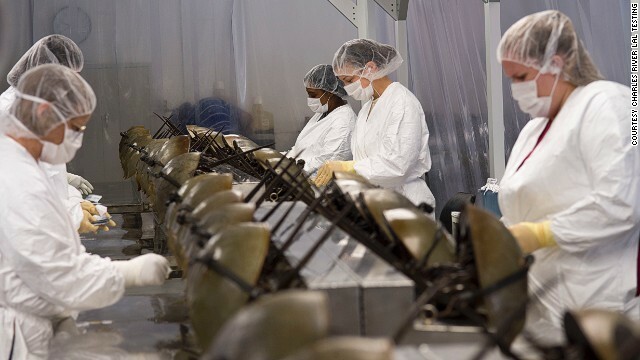 The horseshoe crabs are a part of a multi million dollar industry. And these scientists are blood mining the medical equivalent of gold. After donating their blood, fisherman, Jerry releases the crabs 70 to 80 miles away from where they were caught. This ensures they aren’t picked up and re-bled again too soon. 15% of the blood donors don’t survive and the areas where they are released can become stinky with rotting carcasses. Who would like to live next to a drop off pond? Horse island residents get ready! These ancient creatures are absolutely magnificent. However, they do not need to be bled anymore. 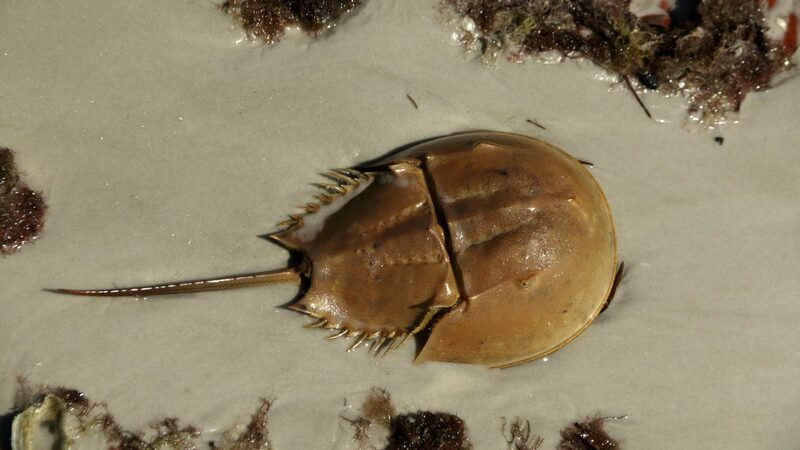 There is a synthetic and sustainable alternative called recombinant Factor C. This is the same enzyme as in the horseshoe crab, but produced in a bioreactor. Never heard of this before. Fascinating. The place looks like something out of a science fiction film. What an astonishing article. I had no idea that crabs save lives!